I made a new cake a couple weeks ago and I can't believe I haven't posted it yet! I guess I'll just say that it's because life keeps getting in the way. We've had a lot going on over here with vacation, being out of town, and setting up a pool...twice. I haven't been getting as much work done as I'd like and I certainly haven't been cooking as much or posting about it. But I'm making it a point to write about this cake tonight because I'm not only too tired to do anything else, but it's just so good that I have to write about it. I'll start by talking about the ingredients I used in this impromptu creation of mine. Yes, impromptu. I still had some apple butter left and thought I'd give it a try in a cake. Ten minutes later, I had written my cake recipe and had started putting everything in a bowl. Apple butter has a lot of spices in it, but I added a few more to give more depth and flavor. There are the standard cake ingredients like eggs, flour, and a little bit of sugar as well as one little twist: a banana. 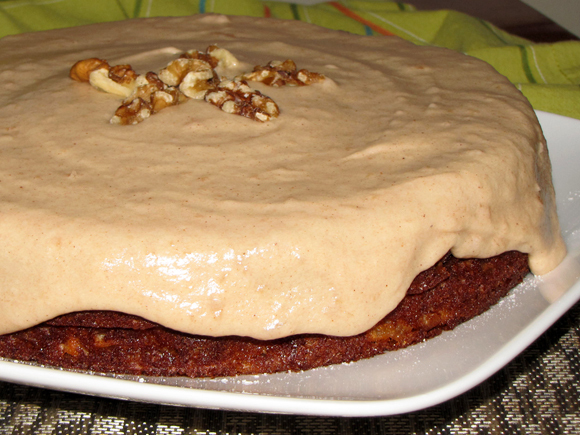 I know a banana might make it sound like I made a banana cake, but I actually used it to act as an oil substitute. My other ratios deemed it necessary to use a little bit of oil, but the banana took the place of most of it. And I'm definitely going to use that trick from now on because you couldn't even tell the difference! Needless to say, this cake is really good. My husband even loved it! It's super moist and full of apple-y goodness. 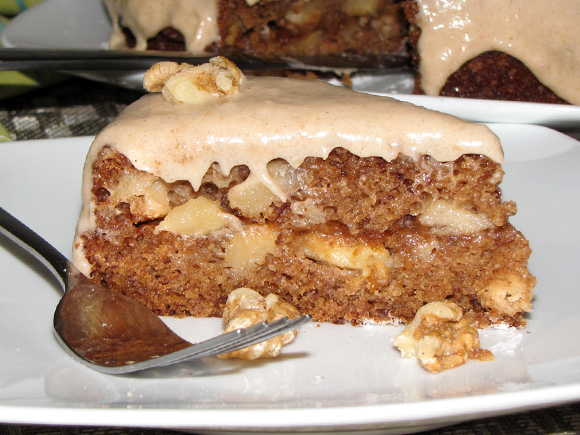 Chopped apples add an almost airy quality to the cake and they offer bursts of flavor in every bite. Frost it with the Apple Butter Buttercream Frosting and you're in for a real treat! 2. Cream eggs, apple butter, brown sugar, white sugar, vanilla, and oil together in a medium sized bowl. 3. Mash the banana and whisk it in with the egg mixture until it's mixed well. 4. Mix the flour, cinnamon, nutmeg, baking powder, baking soda, and salt together in a separate bowl. 5. Add the flour mixture, a little at a time, to the egg mixture. Incorporate each addition before adding the next. 6. Fold in the apples and walnuts. 7. Spray two 9" round pans with cooking spray or grease and flour them. 8. Pour cake batter evenly between two pans and bake for 23 to 28 minutes or until toothpick inserted in middle comes out clean. 9. Allow to cool in pans for about 15 minutes then transfer to wire rack to cool completely. 10. Place layers on top of each other with a thin layer of extra apple butter (or frosting) between them. 11. Frost the cake. To get the frosting effect pictured, slather some frosting in the middle and spread it out to the edge with a butter knife. When you spread, be sure to push a good amount to let it 'drip' over. I had about 1/2 c frosting left over. 1. Beat all ingredients together. Keep frosted cake (and frosting) refrigerated.